Tulsa Rock Quartet dedicates itself to bridging the gap between the classical and rock performance worlds, as well as all the worlds in between. Originally conceived as the Tulsa Rock Ensemble, the quartet made its debut at Cain's Ballroom in Tulsa for the ABOT Music Awards in August, 2009. Recurring performances led to TRQ's performance as the house band at the 2011 ABOT Awards show at the Hard Rock Casino. Past performances include Oklahoma Arts Council's 2011 Conference, Tulsa International Mayfest, Tulsa Performing Arts Center's Brown Bag It series, Utica Square's Summer's Fifth Night series, Hyechka Club Tulsa's Performers Choice series, Tulsa Historical Society, and numerous school performances and workshops. TRQ has been the recording string quartet for Eric Himan and Brady Orchestra. Dedicated to education and community outreach, the quartet frequently performs at fundraising events. 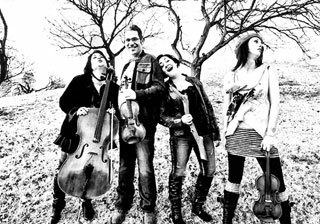 Through energetic and innovative performances, Tulsa Rock Quartet seeks to introduce string quartet music to a diverse audience and to inspire young musicians as well as entertain and delight audiences of all ages.